In a Delayed Price Contract, the seller delivers the grain to the buyer and is issued a contract. The seller of the grain can then price the contract at any point in the future. This type of contract allows the seller to deliver the grain at their discretion, but wants to be able to price the grain at a later date. The seller believes that the price of the grain will rally in the future. Typically, there is a storage fee (or a similar charge) per month for grain held on this kind of contract. 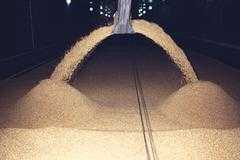 Normally, the title to the grain will transfer to the buyer upon delivery of the grain. Ÿ Seller does not get paid until contract is priced. Ÿ Usually, the seller must pay a “storage” fee until the grain is priced.